Modern gulets are comfortably equipped with all of the amenities of home and encourage an environment in which you are expected to do nothing but enjoy yourself. 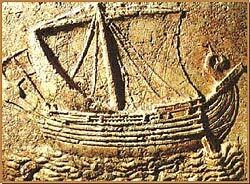 A typical Mediterranean vessel of ancient times was the galley , usually propelled by oars. We know that in ancient times it was difficult to obtain large pieces of timber from native Egyptian trees and the use of wood on a larger scale had to wait until the technology was available to cut, shape and join the timbers. 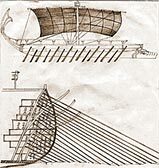 This involved skilled woodworking techniques and the use of fairly advanced tools, skills that were not really available until just before the beginning of the dynastic period, which is when the first evidence for wooden boats appears. In its simplest form, a wooden boat consists of a bottom and two side planks lashed to the bottom by rope. This type of construction is remarkably effective, for when wet the wood expands and the rope shrinks, providing a watertight seal. Many of the early wooden boats are papyri form in shape, i.e. identical to the shape of papyrus boats. To some extent, the similarity in shape may be coincidental, in that boats tend to be ‘boat’ shaped the world over, but the builders probably copied the designs and shapes with which they were readily familiar. The hull, with the planks lashed together by rope, not pegged or nailed, is elegantly papyriform. The boat has no mast or sail and was provided with twelve oars and steered by two larger oars at the stern, one on either side of the vessel. On the deck, near the bows, is a small wooden baldachin’ or canopy. This would have provided shelter from the sun for any lookouts at the bow of the ship. The windowless wooden cabin has two chambers inside, and would have offered some privacy for its occupant. It has a curved roof, and a wooden framework, which was probably covered with a linen canopy, making it well insulated against the heat. The high bow and stern posts are carved to imitate tied bundles of papyrus. Both are purely ornamental and are made to fit over the end timbers of the bow and stern. The commercial boats known as "large-hulled-boats" and the war ships defined as "long-boats by Homer, traveled between the harbours by means of sails and oars. The frescoes of ancient Greek art illustrate the use of boats for transportation, fishing, and as pleasure crafts. The dependency of the culture on the use of boats was dictated by its isolated island geography. Because of this cultures location in an water environment the association and use of boats and ships in most activities within the culture was universal. Under these circumstance we can assume the evolution of the boat building technologies was of premium value in this society. Underwater-Archaeology is not yet 50 years old, but this new branch of science could give to archaeology in general a lot of new impulses. Hundreds of shipwrecks have been excavated from the bottom of the Mediterranean Sea in the last years but the wreck from Uluburun now shown in the Bodrum Museum of Underwater Archaeology is a real spectacular found. A hall specially built for this wreck has been attached to the Museum in the Crusaders castle to host this wreck, perhaps the oldest wreck known worldwide so far. Many of Bodrum's native boat builders learned their skill as apprentices to the late Ziya Güvendiren, Bodrum's master boat builder who lived and worked here all of his life. Today's boat builders pass on those same skills to their young apprentices who may one day start yards of their own. Mehmet Usta (another famous boat builder) explains that the semicircular stern of a gulet must be perfectly shaped and fitted. ‘Unless the builder gets that right he cant make a gulet, even if he is a marine engineer. It is not just a question of calculation but also needs a good eye. We learnt by practice. Of course you have to know the length and the breadth and be able to do the calculations, but shaping it needs craftsmanship. ’The gulet is the boat of the celebrated Blue Cruises along Turkeys spectacular southwest coast. With its roomy deck at the stern this traditional boat is perfect for passengers to savour the delights of cruising the inlets and coves. The early history of this sailing boat remains largely unknown, apart from the fact that building these boats in Turkey is a tradition unique to Bodrum, although the gulet itself is suitable for sailing in all seas. ‘It is unsinkable,’ says Mehmet Usta. ‘The bottom of the hull should be in the form of a reversed S shape. Builders in other areas cant manage it. They tried in the Black Sea yards and couldn't do it. I saw gullets made in Marmaris. They lay the cross-timbers of the beam straight, which means they can finish the job in a day. But the cross-timbers should be laid on the slant. Making a single gulet takes about one and a half years, including the cabin, and sells for about 133,000 dollars without the engine. The last engine he fitted in a gulet was an EMTU Mercedes, which costs about 32,000 dollars. With additional costs such as fuel tank and hose, the total outlay for a gulet ready to sail is between 187,000 and 213,000 dollars. When we asked what kind of wood was used in gulet making, we were surprised when Mehmet Usta replied, ‘The type of wood doesn’t matter, but the timber must not be cut when the moon is new. Then it will be susceptible to worm. It must be cut at full moon, whether it be pine, mulberry or mahogany. Wood cut in June, July, and August is the finest. Today, most of Bodrum's boatyards are located in Içmeler, but there are also well-known boatyards in Gümbet, Ortakent, Yalikavak and Güllük. At the end of 1998, there were approximately 4500 boats registered in Bodrum, according to the Izmir harbour master. Most of them were built in Bodrum in one of over a dozen large boatyards and numerous small ones. Local boatyards combined launch 15-20 boats per year. The procedure of building boats today has changed very little over the centuries. The changes to the basic plank-on-frame method are superficial: electrical tools now allow craftsman to sand and shape wood faster and with more precision than they used to be able to by hand, and laminated epoxy allows for increased design options. Inside the boat, design has changed over the years have increasingly opted for larger dining and lounging facilities. A properly maintained boat can last over thirty years. Each winter most boats are taken out of the water and the hulls scrubbed and given a thick coat of paint in addition to other routine maintenance. 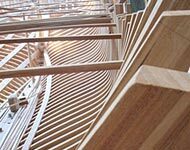 The traditional construction of a boat starts with the laying of a keel (keel is foundation beam for the boat and ship), a massive piece of wood supported on a branching stern about a foot above the ground at both ends. This is stepped to take the stern-post (rearmost part of a ship or boat) and also the stem post (the pointed front part of a ship or boat), all made of massive pieces of timber. The keel is laid first and later the planks or ribs are attached. Usually for the keel and stern one single piece of wood is always preferred. The planks are then fastened horizontally on either side of the keel. The planks join is edge to edge. Once all interior bracing and supports are fitted, work begins on interior cabins and hull planking. When the hull is almost completed a customary ceremony takes place: the insertion of the baklava wood. The baklava wood is the last piece to be inserted, it is called baklava wood because its insertion signifies that an important phase of construction is now finished and a joyful event accompanied by a small celebration featuring baklava (a popular Turkish sweet pastry) ensues. After this minor milestone, work then continues on interior and topside construction. In addition to all woodwork, all metalwork is also done in the yard or by special fitters in Bodrum, usually in stainless steel. Raw pieces are shaped to fit the required applications, be it spar, stern rail or fuel tank. Rigging is constructed by the yard or local specialists, custom designed and fitted to each yacht individually. With the exception of mechanical parts such as engines or electronics which are bought elsewhere and installed by the builder, the entire craft is supplied and constructed by local craftsmen in Bodrum. Launching can sometimes be a Herculean task. Many boatyards are located well away from the sea and often huge boats must be brought several kilometers for launching. Smaller boats can be transported by trucks or pulled on trailers. With the bigger boats (sometimes over 30 meters), a sledge is placed under the keel and used to transport the boat to shore and employed for launching. Well greased wooden blocks are placed on the road and continually moved, back to front, as the sledge progresses. It is not unusual to turn the corner on to a Bodrum street only to find the way blocked by a huge yacht slowly making its way to the sea. The grease used to oil these sledges and blocks of wood is that of sheep fat. A large cauldron is made from an empty steel barrel, and packed with salted fat which is solid until heated with a fire below the barrel. The liquid fat is then amply used for lubrication, and most builders claim that nothing synthetic works better than this timeless method. At the shore before launching, boats undergo a christening ceremony, but instead of a bottle of champagne smashed against the bow, a sheep or steer is sacrificed in accordance with Muslim custom, and the blood smeared on the bow to ensure good luck and safe voyages. Another custom during launching is "tel kisti", a mild difficulty encountered in the launch and a good humored refusal to get on with the job until presents and gratuities are presented by the boat owner to the construction crew. The closeness of the small group of people on board promotes an atmosphere of friendship and sharing; relations among passengers and crew tend to be relaxed and casual. Travel agencies can arrange charters and fixed tours for a specific group of people or for you individually. Unlike cruises on large ocean liners, on a gulet you can explore the secluded and often deserted bays and coves of the coastline. Mainly there is a crew of three includes a fully licensed Captain, a cook and one or two deck hands who are all experienced in their work. They are at the service of charters on a 24 hour basis. The cabins of the crew are completely separated from those of the passengers. The most common gulets have 6 to 8 double cabins and so accommodate max.12 to 16 passengers. Unlike cruises on large ocean liners, on a gulet you can explore the secluded and often deserted bays, coves and islands of the spectacular Turkish coastline. Since Bodrum has its own airport (only 35 km) it has become more and more a prefered starting point for Gulet charter.